What’s Going on in KatersAcres Polymer Clay Studio? Welcome back to another WIP Wednesday in KatersAcres polymer clay studio. 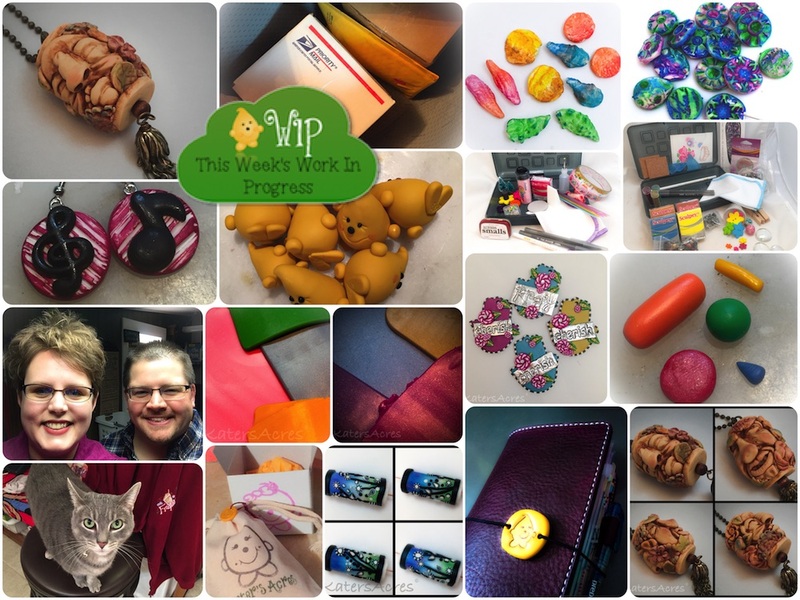 WIP Wednesday stands for “Work in Progress” Wednesday in case you didn’t know… Today not only will you see some things I’ve been working on, but you’ll also get a few of my recommendations as well. ENJOY and don’t forget to join me in Parker’s Clay Tribe, a free polymer clay FaceBook group. My newest work in progress is a necklace made from molds of my most recent faces I showed you in my February challenge post. It’s a giant bead necklace that’s opera length. A lot of shipping has been leaving the house with not only orders, but lots of swaps. You can see my most recent swaps here. Don’t miss out on this month’s Polymer Clay Tutorials from Ginger of The Blue Bottle Tree. Read the post and get a coupon here purchase them too! In Parker’s Clay Tribe I’ve offered a total of 4 “tribal boxes” that include a ton of miscellaneous supplies that I have way too much of sitting around the studio. I’ll be offering these every once and awhile in the Tribe, you can come over and join us there. The Hamsa’s I just made for the February PC Adventure swap. Ah yes, basic sculpting shapes we all need to know and use. My beloved midori from Chic Sparrow is how I manage to NOT lose my mind. This four sided bead was an inspiration from a glass bead and proves that polymer is a fantastic chameleon material. More cute little Parker packages were all wrapped up and ready to ship out this week. Little Miss Smokie the cat was my helper this week, but she kept stealing my chair! Hubby and I both got new glasses this past week. It’s a miracle that I can actually see again. The world is bright, shiny, & new! These music themed earrings I made for our church choir director and organist. She loves dangly earrings and I thought these would be perfect for her. Last but not least, it’s a Parker party! I’m doing a BIG project this year for something I really believe in. More details will be coming soon, but basically, I’m making oodles more Parker figurines than ever before. FYI: I do tend to post photos on Instagram during the week so you can follow and stay up to date with me and what I’m working on (and get a surprise coupon every once and awhile too). Feel free to come over and follow me on instagram so that you can see behind the scenes work in my studio as well as some tips & tricks as I post them.